A whiskey that celebrates the richness and beauty of wood. 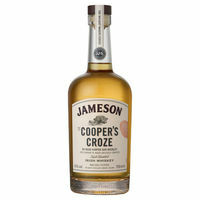 The Coopers Croze is a whiskey created by Head Cooper, Ger Buckley, showcasing the diversity of barrels at the Midleton distillery and the profound influence the wood yields. The Coopers Croze is a carefully crafted whiskey that effortlessly carries vanilla sweetness, rich fruit flavours, floral and spice notes with the undeniable influence of oak.